Sigma offers more labeling system choices than any of competitors. From case labelers, floor scale labelers, pack out Giveaway tracking labelers and reject scales to weigh-price labelers and manual pre-price systems, we can label ANY box, pallet , case or package that your application calls for. All of these systems are driven by our LABELpaq labeling software. We manufacture 22 different models of NEMA 4X computers and washdown thin clients and have over 6400 in use throughout North America and Latin America. The most popular models that we use for our LABELpaq systems is the 629-R. NEMA 4X rated and the only labeling computer with a separate washdown keypad AND touchscreen. Our keypads utilize programmable keys that allow operators to delete, reprint and manipulate our LABELpaq software. We manufacture these units in house and do not resell someone elses computer. This means we have total quality control and much lower parts prices than any competitors. We have over 2000 case labeling systems in use throughout North America and Latin America. Our LABELpaq case labler model AS-10 and 20 systems can be had in both single and dual printer configurations. 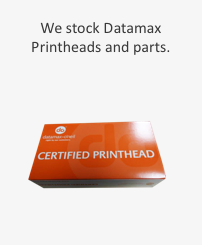 We typically use Datamax I or H class printers but can use any printer that you choose. 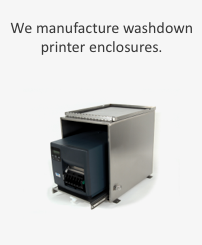 The AS-10 is completely washdown with individual washdown printer enclosures instead of huge, paper and debris catching enclosures. Of course our computers are offered both wired or wireless so the entire system is networked. The end of every line in every food manufacturing company typically has a scale for final weights. We have raised the bar. Our SM scale is NTEP approved. In addition to rejecting off of weights, will label (both side and corner wrap), will reject if wrong label is placed but most importantly will track in wireless and real-time, the giveaway in both percentage and actual dollars of the products weighed on that scale! It is also Allen Bradley enabled. Of course it is driven off of our LABELpaq labeling software- no system exists like this anywhere. We have 3 models in different price ranges for any budget.